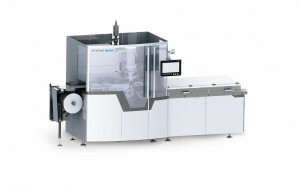 The OYSTAR Group to present several new machines for a variety of applications at the interpack 2014. Stutensee, March 12, 2014. 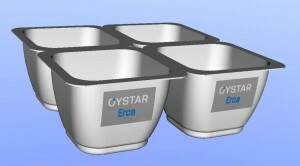 For example, OYSTAR Hassia has expanded its product portfolio in the lower-to-mid-level output range with an ergonomic FFS machine for mini-portions and cups. Users will benefit from its compact construction and ergonomic operation. At only six meters long and 1.3 meters wide, the system can be integrated into any production hall without claiming too much space. The cup web is transported at a comfortable height of one meter, making the visual inspection of the work process easier for operators. The FFS machine can handle up to 35 strokes per minute depending on format and product characteristics; for example, with 30-up format 63,000 mini portions are produced per hour. Even smaller capacities such as 14,000 cups per hour can be produced on the machine. In addition, the diversity of dosing systems makes the machine suitable for a broad range of applications for all liquid and pasty food and dairy products. It can handle all thermal plastic and sealable materials, including PET and PP for the bottom web. The technical design also makes it possible to use thinner packaging materials, to fill products of differing consistency with the exact volume and placement at minimized waste. With its new FFS machine for StickPacks, OYSTAR Hassia will have an even broader footing in this packaging segment, which is growing strongly due to its great convenience for consumers and low material costs for producers. The new machine has an attractive price-to-performance ratio which OYSTAR has achieved by a successful co-operation under the motto “German Technology – Indian Production – Global Service”. It is also suitable for a wide range of applications: In addition to liquids and pasty products, the machine can handle powders and granules with customized filling systems. It can produce StickPacks up to 50 mm wide and 200 mm long in various designs. With a material width of 900 mm, the machine on display at the interpack produces up to 57,000 StickPacks per hour. Based on its wide experience with cup FFS machines with in-mould decoration systems in operation around the world, OYSTAR Hassia breaks new ground. The result: a wrap-around labelling system in 4 row version which is appropriate for cups of circular to rectangular basic shapes and usable for up to 48-up format. Besides significantly enhancing output, and thus profitability, at a speed of 30 strokes per minute, the wrap-around labelling unit is compact and also features an attractive price-to-performance ratio. 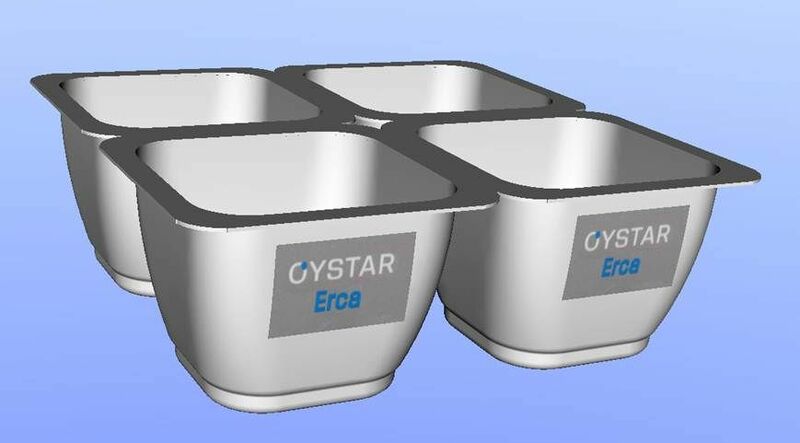 OYSTAR Erca presents an FFS machine for multipacks at this year’s interpack. Starting immediately, the already popular M-F 14 can also produce cups made of polypropylene (PP). Not only does this reduce costs, it offers the advantage that individual cups are significantly more robust and the multipacks can be separated more easily. The PP option can be seamlessly integrated into existing M-F 14 machines. The M-F 14 was constructed as a compact machine according to 3A regulations and produces up to 12,000 cups per hour. It also fills a huge variety of products, from tomato paste to fruit compote all the way to conventional dairy products. Additional features of the form, fill and seal machine are its simple operation and its user-friendly work surface height of nearly one meter. Furthermore, the OYSTAR Group presents a new filling and sealing machine for pre-formed cups with a chainless drive concept. Allowing automated format changes in less than 20 minutes significantly improves equipment availability for production and consequently the OEE. This makes it profitable to even produce variable packaging formats on our cup filling machines. Maintenance costs are also reduced because there is no need to replace the transport chain or carry out any of the adjustment work needed for chain stretch. The FS machine can be equipped with up to three dosing systems. Equipped with a single dosing system, the machine transports preformed cups with a fill volume of up to 600 ml and a cup height of up to 150 mm. It can process up to 32,400 cups per hour. The machine operates without lubricant and using optional UV-C disinfection for cups and lids makes it ideal for hygienic production applications. 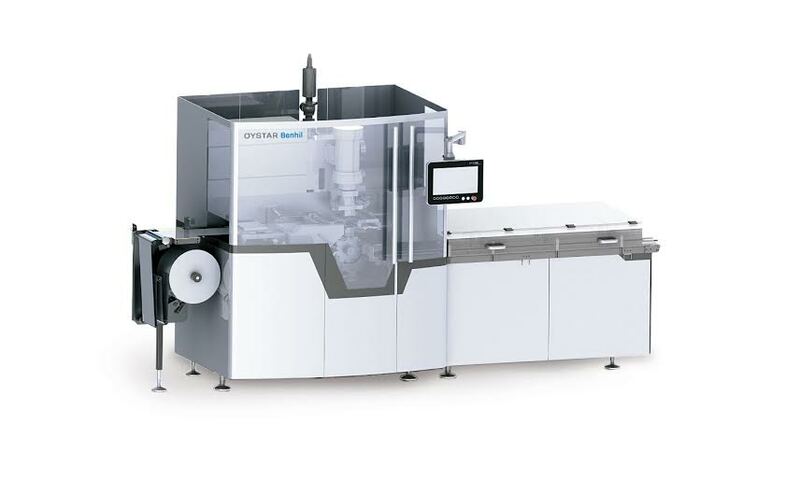 After updating its complete range of Multipack series packaging machines over the last few years, OYSTAR Benhil now presents the new Ecopack series at the interpack 2014. The main features of the Ecopack F1000/F1500 wrapping machine are its modern drive concept, its CIP-capable dosing system and its exceptional filling accuracy. In addition, the front fold principle saves up to 30 percent more packaging material than the conventional bottom fold. The appeal of packets produced on the Ecopack lies in their sharply defined edges. As specialists in final packaging, OYSTAR A+F will be present in Düsseldorf with a newly developed packer with flexible application. The machine uses a 4-axis Delta 3 robot to group portion cups, thermoformed trays, pouches and blister packs into cartons. It is also the perfect packing solution for products in secondary packaging. The packer can handle trays and wrap-around cartons as well as cases with lids and two-piece trays. Depending on the box type, the packer can provide an output up to 40 cartons per minute in single lane and 70 in dual lane. In addition, OYSTAR A+F will be presenting a new, modular palletizer: a loader for the lower and mid-level output range. The standard version of the machine loads and unloads the pallets manually, but there is an automated solution available as well. It is still possible to integrate layer sheet processing and packaging rotation equipment into the machine. With a servo-driven container feeder that needs no spacing devices, this machine can handle layers with great flexibility. It can feed folding cartons, wrap-around cartons and cartons with loose lids, as well as trays with and without lids. Depending on the type of layers and the machine equipment, the palletizer can provide an output up to 150 layers or 1,400 containers per hour. The palletizer’s drive is run by a servo-motor using a flat or a toothed belt. This guarantees the best possible service lifetime and simplified maintenance. Furthermore, the linear actuators feature a clamping device to prevent falls, enhancing the protection of the machine and its operators.